On April 4, 2011 the SACMS was fortunate to be able to present the Lafayette String Quartet in two Outreach Events. We started off with a fortifying and traditional breakfast for the quartet at San Antonio’s legendary El Mirador. Then Allyson Dawkins and Ken Bloom drove the quartet to Churchill High School where the quartet played and talked about some of the Elliott Carter String Quartet No. 3. The Carter work represents a landmark in modern string quartet writing that boggles the mind of most professional musicians. It was fascinating to watch the high school aged string students poring over the score of this very difficult work. Later we all headed over to the Winston School for an afternoon concert. 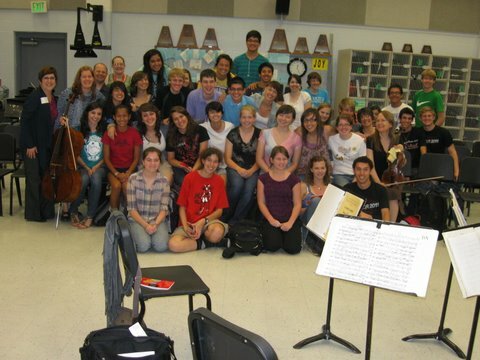 At this event the entire student body was ushered into the school gym where the concert was performed. After the concert which included some explanation, the students were able to interact with the musicians asking questions.